The plants along the stream at James Gardens were really starting to pop open when I was there a week ago. Soon the bridges will be surrounded by greenery! Many golf courses feature water - small canals or lakes and often they have bridges over them. 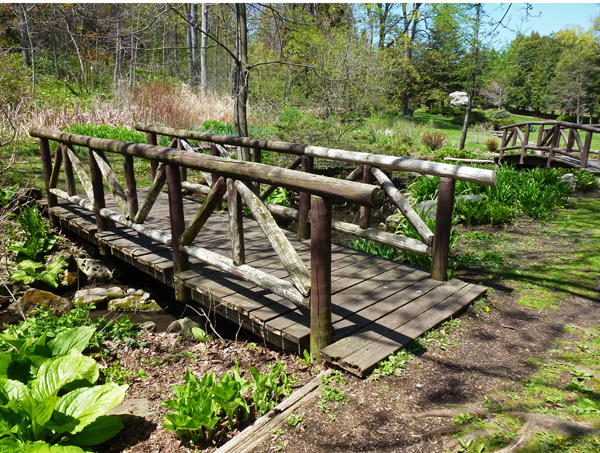 Stone bridges, as you might guess, are my favorite, but I also love wooden bridges such as these. James Gardens looks like a super place to spend some time on a nice warm day. It's great to see all that green bursting forward! Looks so lovely Pat, spring is fabulous! Just think how lush they will be in a couple more weeks. Once the weather warms up things just start growing like mad. I counted 5 tiny tomatoes already starting to form on my plants in the garden . . . I love seeing Spring and Summer working their magic on the plant life all around. Enjoy the season to the fullest, because Fall and Winter always follow. Aren't these two beautiful and different bridges. I can hear the creak! I love this process, it's like everything is brown, greyish, leafless, and stark, but in a blink of an eye, it's a magical landscape everywhere you look.